Count Dracula (played by Victor Fabian) is able to control Lawrence Talbot - the wolf man (played by Don Glut) to bring back victims for the count to feats upon. Nice homage to the Universal monster classics has Dracula using Larry Talbot to keep him supplied with fresh bodies. Talbot, as a werewolf of course, manages to bring Dracula his latest victim but when the vampire refuses to give Talbot his freedom, the two monsters battle. If you're familiar with the early work of Don Glut then you probably already know that he loved these Universal monsters and decided to make his own movies just so he could show people the monsters that he loved. For the most part this is a pretty entertaining short as it lasts just under 7-minutes and features plenty of action in that short time. The make-up effect on the wolf man looks pretty good in its no-budget way. I also liked the way Dracula looked here and there's no question that the two have a nice little fight sequence. Glut clearly was having fun putting these monsters on film so fans of those old Universal movies should get a kick out of seeing a kid making his own movies. 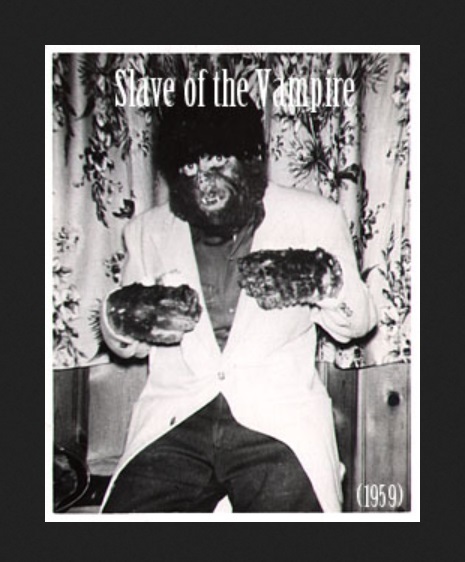 SLAVE OF THE VAMPIRE is one of many short amateur movies shot by Donald F. Glut in 1959. Once again this one is a Universal horror tribute that teams up Dracula and the Wolf Man, although Frankenstein's Monster takes a well-deserved break at this point. Glut himself tackles the Lawrence Talbot role, and this brief outing has plenty of action and even a fight scene to recommend it. The climactic staking is well staged on a non-existent budget.